I got a set of stiff springs for Tomos and having never changed the springs before found it to be quite a challenge with heavier springs. I found a method that seems to work pretty easily, so here it is. 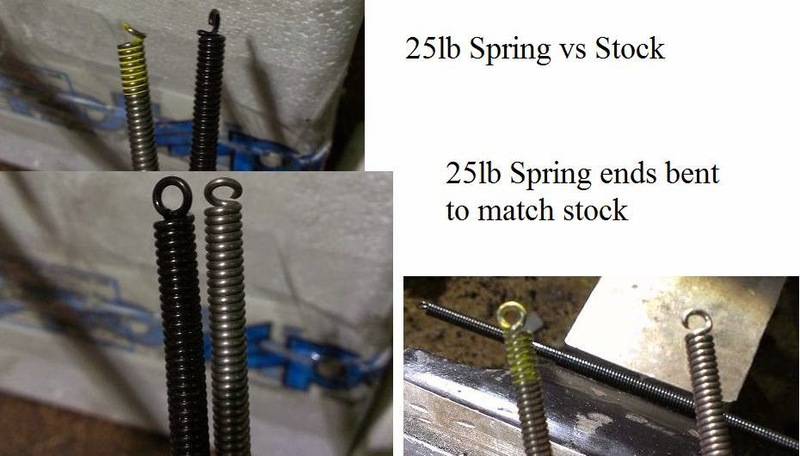 The first thing the performance springs needed was to bend the ends to match the black stock springs. 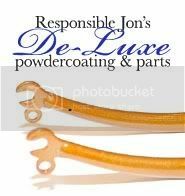 I put them barely in the vice and used my hands to bend the spring carefully by the base until the ends were standing up like a hook. Once I hooked the ends together I squeezed them a little tighter so they wouldn't easily come apart. 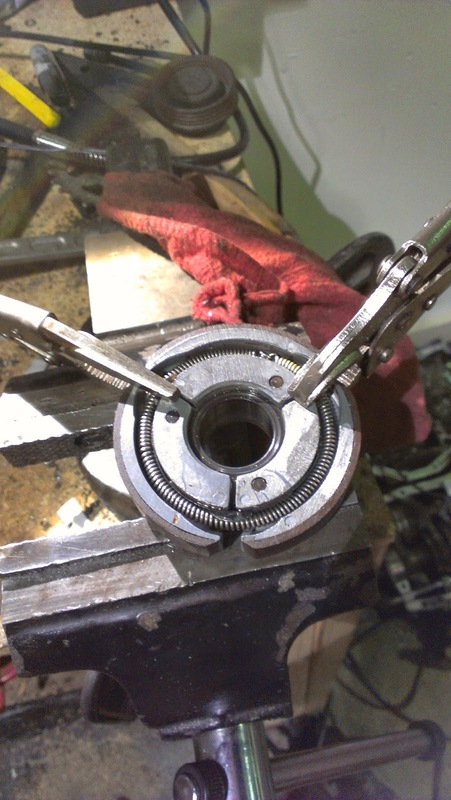 I clamped the second speed clutch by the attached gear, and used a bolt to hold the first speed down. Then press the spring into the first keeper and install a locking pliers. It doesn't have to be that tight. Push the spring into the second keeper and install your second locking pliers. I installed the hooked section of the spring in the middle of the first and second keepers. 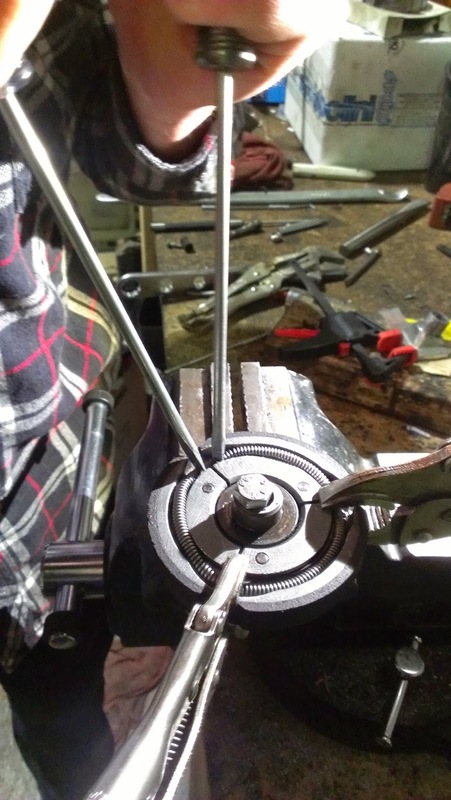 Take two long flat screw drivers, round shaft work best, and set them against the clutch arm right on top of the third keeper. Pull the screw drivers back gently and the spring slides down to the top of the keeper. Now just twist the screw drivers so the blades force the spring out over the keeper and push it down if it doesn't quite fall into place. It's all in the placement and rotation of the screw drivers. If you set them wider apart you can't get the spring to fall into the slot because there isn't room for the screw drivers to be out of the way. By placing the screw drivers against the shoe, it is solid and won't budge against them, but if you try to pry against the keeper you are going to bend it and have a bad time. The little twist pushed the spring out to clear the keeper without having to pull on it any more. Easy as pie. When I stored my free spirit for the winter, it was leaking gas out of the carb pretty bad when the petcock would be left on. No big deal, turn it off, but when you forget, all of a sudden your garage smells like gas. I had a guy contact me wanting to buy a bike, so I sold him this one, only to remember that it was a dribbler, so I told him to come back in two days and it would be ready for him. I have to hit the tank with acid too, because I stored it dry and it got all flash rusty. Here are some blurry fish-eye shots of the carb, I love new gaskets, floats and needles with a tip of viton. I decided the tall bars on the Motron are just too wide, so I pulled out the pipe cutter, and removed 1 3/4 inches out of the middle. I tig welded them back together, and the took a half inch of the ends of each bar, bringing everything nice, tall and narrow. Looks good, feels good, glad I finally did it. When I bought out Everett's old moped shop, along with the parts came a large variety of factory and home made tools. Some are easy to identify, some take a bit to figure out what they are for, and some I have no idea. This one was pretty easy. It is a Maxi swingarm welded to a motorcycle sprocket, with some notches ground into the tensioner part of the swingarm, so an axle can rest in it easily. It has a mobile arm attached to it with a little threaded foot to accept a dial indicator so you can true wheels. Pretty slick. I'm using it as a tire changing stand. Hang your new tube in the swing arm, set your wheel in place and tighten the axle down so it can't escape. 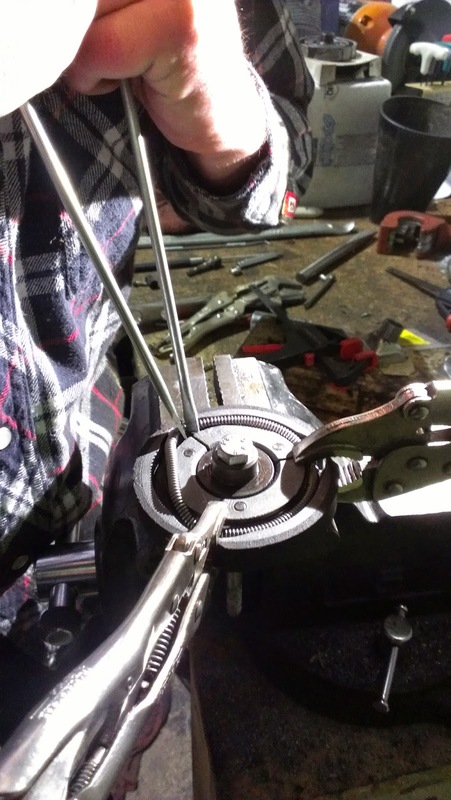 With the sprocket clamped to the work bench, your tire stays in place wonderfully as you pry with the tire irons to remove the bead and withdraw the tube. Then you simply bring the new tube up, tuck it in, and use your hands to finish the job. If you were replacing the tire as well, you would have to remove the wheel to get the old tire out completely and insert the new one, so a bit more work, but it is nice to not be wrestling around the garage with a wheel in my hands pinned to the floor under my knees. I love to think about what it would have been like to be of moped age in 1977, wishing to have one and going to your local library to check out any books they had on mopeds so you could read all about them, and then buying a book on mopeds just so you could convince your mom she should totally buy you a moped. You pick out the one you want (Puch Maxi Sport, $525) and she finally buys it for you. You get to enjoy it for about a week because you mixed your oil at 128:1. Where ever this book came from, there is a seized Maxi Sport in the garage. Just waiting for winter to finish, Brian and I caught a nice day to take our Minarelli V1 bikes out for a spin. I love my 58cc DR kit, runs very smooth with a 14:12 and goes about 40mph. Perfecto. I've got this Motron I've been dreaming about, and I pulled an aluminum V1 cover out of my giant stock of awesome parts. It looked good, but it wasn't shiny enough. I took about an hour today and went after it with 200, 400, 800, 1000, 00 steel wool, aluminum polish then 0000 steel wool. It isn't that hard to do a mediocre job polishing stuff, but boy to you get a sweat going. There was some pitting that I didn't get out, I should have started at 100 grit perhaps, but it's shiny enough for me.